You can’t teach what you don’t know. 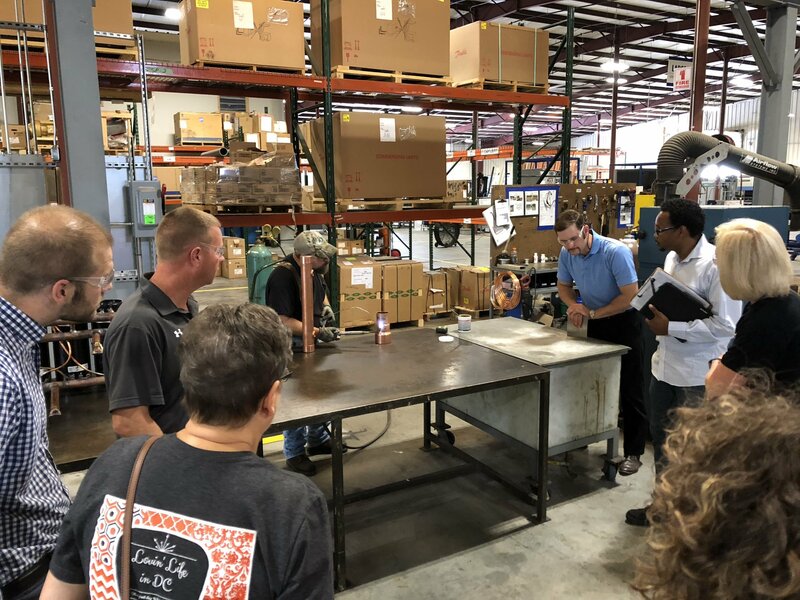 Six Davie County educators recently became the students as they toured area companies to gain a deeper understanding of the skills needed by employers that will help their students find meaningful careers and local industry to grow. During the six-day externship, the educators from Davie County High School and Davidson County Community College (DCCC) toured Ashley Furniture, CommScope, CPP Global, Wake Forest Baptist Health – Davie Medical Center, Flow Honda of Winston-Salem, Ingersoll Rand, Pro Refrigeration, Inc., and VF Jeanswear to learn about all facets of their business. 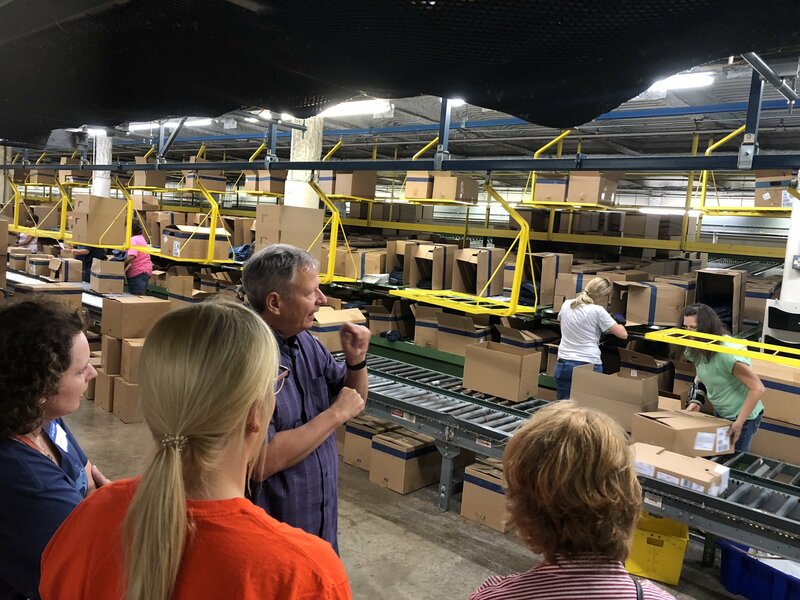 They even received hands-on experience at Ashley Furniture where they constructed the frame of a couch and at CPP Global where they each had the opportunity to operate a different machine to make, label, or pack jars made for companies like Clinique and Estee Lauder. 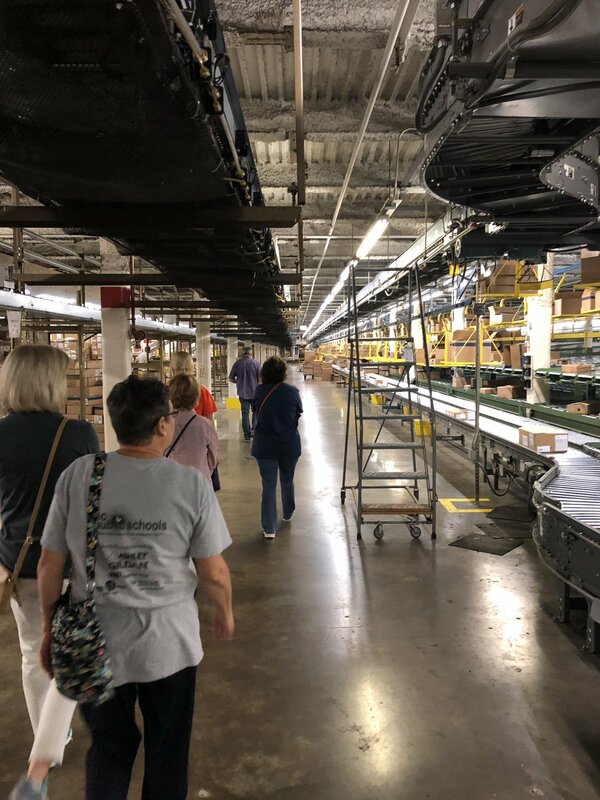 The group also visited Big Brothers Big Sisters of Davie County to learn more about the services the organization offers students and families and the role it can play in helping students reach their full potential. Visits ranged from a couple of hours to a whole day, based upon the amount of information the host location had to share. The purpose of the community partnership between Davie County High School, Davidson County Community College (DCCC), Davie County Economic Development Commission (DCEDC) and Davie County industry is to make local students aware of workforce opportunities and technological needs by providing relevant immersion experiences for Davie County High School teachers and DCCC faculty. Through these summer externships with local businesses in the areas of Career and Technical Education (CTE) and Science, Technology, Engineering, and Math (STEM), teachers and faculty are connected to their related industries to renew their understanding of current industry practices and technology as well as the soft skills necessary for success in the organization. This workforce development partnership, which started in 2014, is funded by the Mebane Charitable Foundation’s $50,000 contribution to the EDC’s five-year economic growth plan, Together We Are Davie. DCEDC President, Terry Bralley, is grateful to the individuals and companies that contributed to the capital campaign and shared the vision for growing Davie County. The externship program was open to all CTE and STEM teachers and counselors. The participants were selected through an application process at each institution and received a daily stipend and mileage for their time. The knowledge they gained will be shared with their students and fellow teachers. 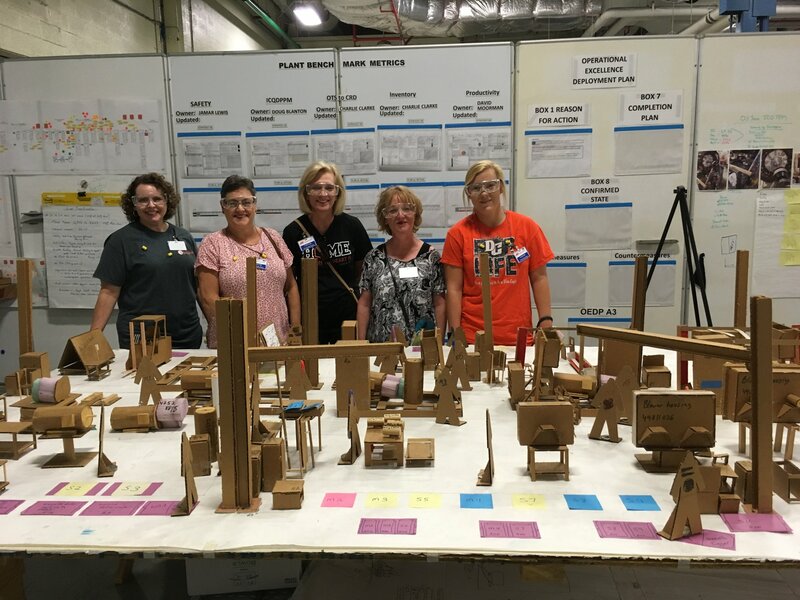 In addition to Davis and Dunn, this year’s participants included John Hardee, DCCC math; Elizabeth Gordon, lead guidance counselor; Sandie Hinkle, CTE (family and consumer science); Mary Sells, CTE (family and consumer science); and Leigha Wilson, STEM math from Davie High. Each was motivated to participate by a passion for helping their students succeed, not only in school, but in life. “I applied for the opportunity so that I could learn more about the type of jobs available for our graduates,” said Gordon. “I learned that all the businesses we visited had job openings. Many of them hire students right out of high school. They are looking for workers with a positive attitude, strong work ethic, and that are teachable. “I will use the information to share with students the skills necessary for various plants and the characteristics that employers are looking for in their applicants,” she added. Dunn said the experience reinforced the importance of teaching soft skills in addition to technical skills. She was also pleased to see that many of the companies raise up employees who show leadership promise. The opportunity to share that message and to let high school and community college students know that there are jobs available was the primary reason Flow Honda chose to participate in the externship, according to Dean Hines, sales manager. Representatives from the other corporate participants agreed. “Wake Forest Baptist Health Davie Medical Center strongly believes that we need to support our community,” said Matt Britt, marketing manager, Davie and Lexington Medical Centers. “The benefit for us is short-term in the sense that we get to connect with community leaders in education and affirm our commitment, but it is also long-term as we have the chance to help support the development of our local workforce. Hopefully, this program helps these school employees lead a young student to consider the Healthcare industry and the many roles we are always working to fill with smart, hard-working, and caring individuals. We expect to participate in this program again. 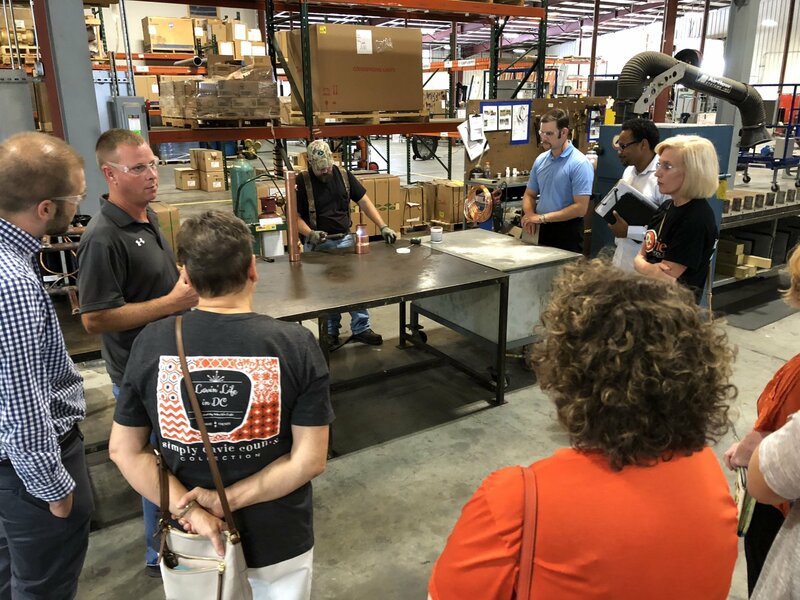 In addition to highlighting career opportunities available locally, the tours also served to dispel preconceived notions about today’s advanced manufacturing. 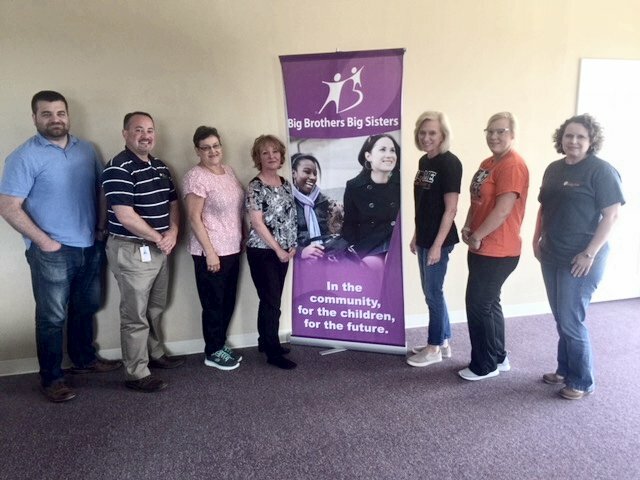 Although not a potential employer, Big Brothers Big Sisters had equally valuable information to share as part of the collaboration. Davis is grateful to the organizations that allowed the externs entry into their facilities and hopes that additional businesses will want to participate next summer. “I’m truly trying to create a partnership,” he said. “I want to include as many businesses as possible. We want our local businesses to know that we aren’t just coming to them for a handout, we really want to give back to them. We want to know what they need in an employee at all different levels, from just graduating high school to a two-year degree or four-year degree. Just because a kid goes to Carolina and graduates with a degree doesn’t mean they can’t come back and have a successful career in Davie County.